videoQC is a suite of video and audio analysis and playback tools with both visual and automated quality checking tools. videoQC will take the media coming into your facility and perform a series of automated tests on video, audio and metadata values against a template, then analyze audio and video. It includes metadata extraction, comparison and templating tools, intuitive charting of audio and video metrics, a full set of audio and video waveform/vectorscope/phase tools, db and PDF reporting, file to file visual comparison and clipping and exporting tools. videoQC’s automated server components can run headless (no interface) for analysis tools. Integration with Net-X-Code suite provides quality control for IP based workflows. Each level of videoQC is designed to fill a particular part of the Quality Control workflow, from intern to master QC operators and even back end servers. The standard database format allows seamless and instant sharing of analysis results. Hot folders allow automation, optimizing those in the QC workflow. 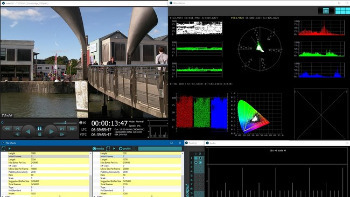 The videoQC Suite provides a range of capabilities from basic file VGA viewing to full on Quality Assurance with export, comparisons and reports.